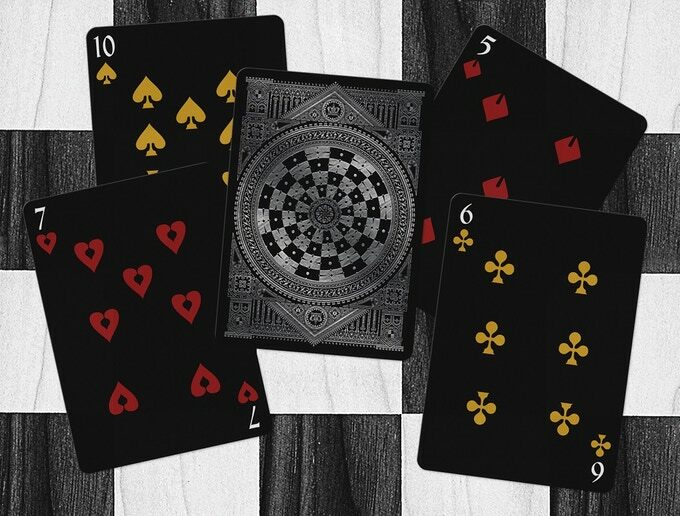 Based in Spain, Karin Yan (Bona Fide Playing Cards) has always known how to combine a taste for avant-garde design and a deep respect for traditional cards. 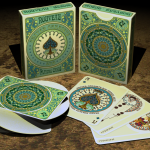 Her Nouveau series is a clear example of that, with reminiscences of the Spanish cards and the design elements of an artistic style marked by elegance and adornment. 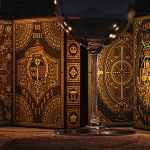 Her interest in art and literature also led her to create two decks inspired by the work of Alexandre Dumas. 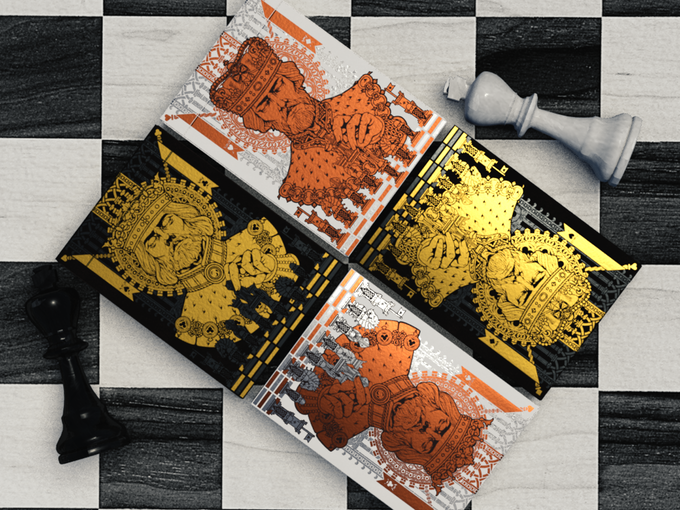 Her new campaign is something completely different and its name is KING’S GAME. This time, Karin has been inspired by one of the most popular and ancient games of civilization: chess. Although it is not the first time we see a deck inspired by this millennial game, the approach of the artist is substantially different. 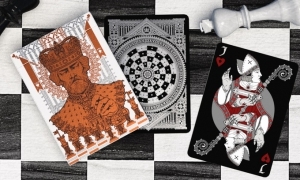 King’s game creates an interesting relationship between the “characters” that participate in the game board and the symbology and the traditional meaning of the different suits in a playing cards deck. 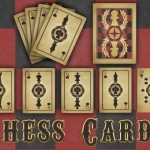 This way, spades and clubs represent the black figures and diamonds and hearts the white ones. 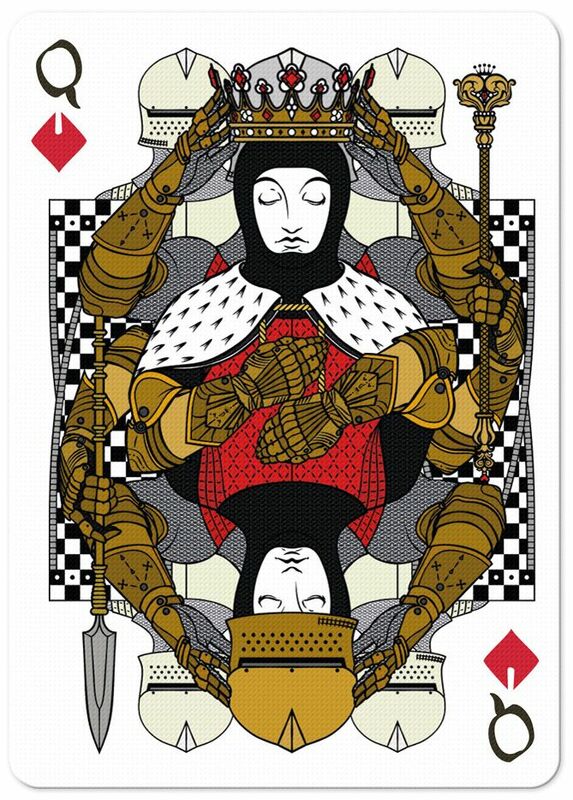 In addition, the number of figures in the game: one (for kings or queens) or two (for bishops, knights and rooks) are also distinguished in asymmetric or symmetrical court cards designs. The pawns, eight per color, are present in just one card, the Jack of Diamonds, in an illustration full of symbolism that even depicts that glorious moment of the transformation into a queen when reaching the other player’s first row. 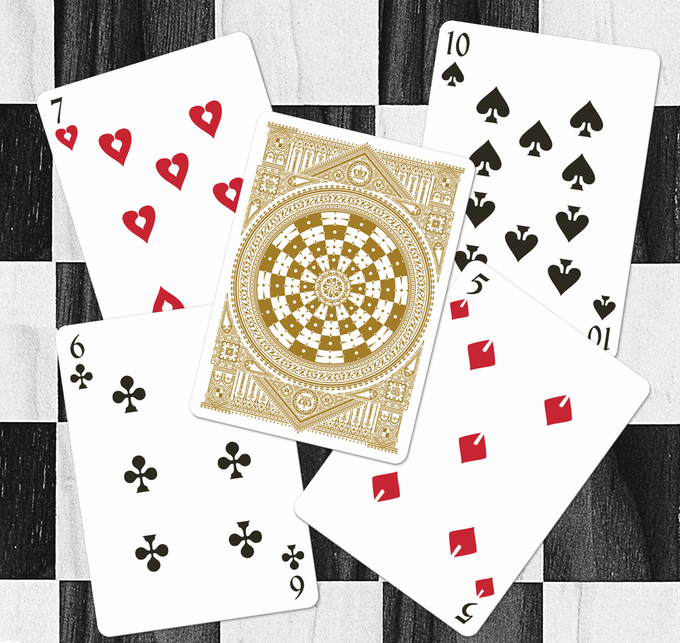 The aces represent coats of arms and the numbered cards are very clean to guarantee the playability of the deck. 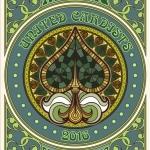 Simple lines in detailed designs with basic colors and great neatness make this deck a fantastic collectible item. 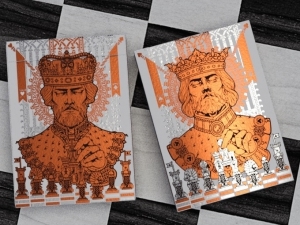 The tuck case depicts two kings playing, one facing the other on each side of the box. Two different editions have been created for the campaign. 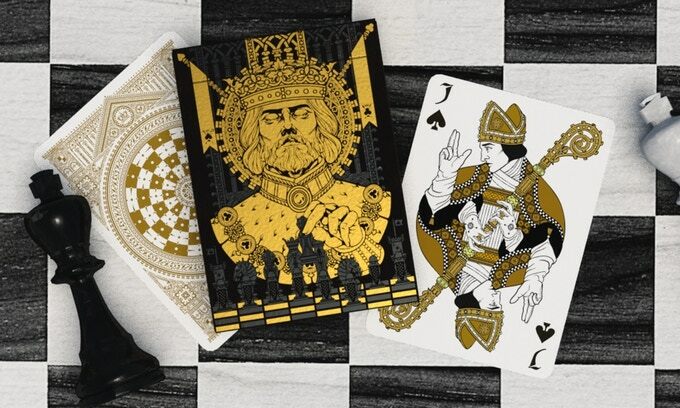 The Black Edition, with a tuck case with gold and black foil and white background in the cards and the White Edition, with silver and copper foil in the case, black background and silver foil in the back of the cards. 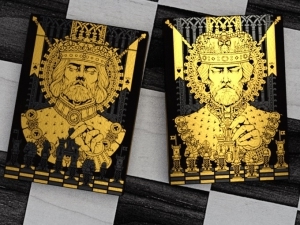 Both will be printed by EPCC in limited editions, with the white one being a numbered edition of 500 decks. In addition, as she usually does in her campaigns, Karin is preparing wonderful objects and accessories to offer once the campaign is funded. You can not miss it. Visit the project website and raise your pledge.